Home » General Health » Exercising for Brain Health: How Much Do You Need? You know that exercise is good for you—but do you know how much you need to reap its full benefits? If you don’t, don’t be ashamed. When it comes to how much you should exercise, opinions will take you from point A to point B—and everywhere in between! Some say less is better, some say more is the only way to get results, and others seem to think you should be active 18 hours a day. Then there’s the intensity of the exercise, but that’s a discussion for another day—one debate at a time. So, how much do I think you should exercise each day? Well, that depends. In my opinion, the amount of time you should spend exercising is dependent on the results you’re looking for (and a recent study backs me up on this). Take cognitive health, for example. If you’re looking for brain benefits, like preventing cognitive decline, a small amount of exercise per week can offer big rewards—with no benefits for doing extra. In order to experience significant memory benefits and improved thinking skills, you only need to do about 75 minutes of moderate exercise per week. Most of the positive results from exercise are dose-dependent, but this doesn’t appear to be the case when it comes to memory and cognitive function. And here’s where that recent study comes in that I mentioned earlier. According to this research in the medical journal PLOS ONE, endurance and overall fitness increase the more you exercise, but spending more hours each week on the treadmill won’t do much for your brain. This new study followed 101 sedentary adults who were at least 65 years old and were generally healthy. They were assigned to one of four groups: a control group, a light exercise group (75 minutes per week), a moderate exercise group (150 minutes per week), and a heavy exercise group (225 minutes per week). Each of the exercise group participants was instructed to walk briskly on a treadmill or use an elliptical for sessions of 30 to 60 minutes. They were also given fitness, cognitive, and memory tests before and after the 26-week testing period. The results showed all the exercise groups performed significantly better on the cognitive and memory tests than the control group (who, if you recall, didn’t exercise). However, there was virtually no difference between the exercise groups, regardless of whether they worked out for 75 minutes or 225 minutes each week. 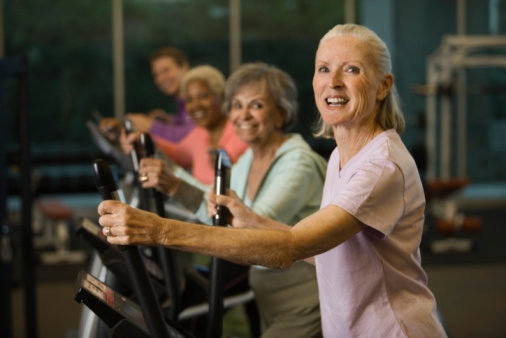 Exercise for the Brain: How Much Do You Need to Exercise to Protect Against Cognitive Decline? If you’re looking to protect your brain as you age and experience less of the memory slips that are so common with being over 65, I’d definitely recommend increasing your physical activity. Even though a small weekly exercise dose of 75 minutes can do the trick for your brain, getting at least 150 minutes can offer more physical benefits to the rest of your body. All in all, it’s up to you—a small dose of exercise for the brain or a bigger serving for your entire body. Vidoni, E., et al., “Dose-Response of Aerobic Exercise on Cognition: A Community-Based, Pilot Randomized Controlled Trial,” PLOS ONE 2015, doi: 10.1371/journal.pone.0131647.